Reverse engineering has long been a sound practice for design. Yet, the technologies that enable it have often been left to the fringes. New technologies, however, are changing that story. This eBook is of most value to engineers at enterprise manufacturers that need to rely on reverse engineering, but also need to overcome the inherent friction in the digital processes that enable it. Reverse engineering has always been an important activity in design. The practice, in which engineers deconstruct and analyze an existing physical thing to understand how it was designed, has always provided a means to reproduce products. Some teams use it to replicate competitive products. Others employ it to recreate components for which no engineering documentation exists. Still others leverage as a means to identify the root cause of failures. It gives engineering organizations an important capability. Despite the significant role that reverse engineering plays in design, its integration into modern digital development processes has been lacking. Engineers must often turn to a variety of complicated and unintegrated software applications to complete the job. A large amount of friction in that digital workflow undermines the effectiveness of reverse engineering activities. That friction erodes engineers’ productivity and limits the time they can devote to design and development. However, new technology is promising to eliminate the digital friction associated with reverse engineering. Software tools that provide the right mix of capabilities to complete the entire workflow in a single environment are emerging. That, in turn, allows engineers to recoup their productivity. Therein lies the focus of this eBook. 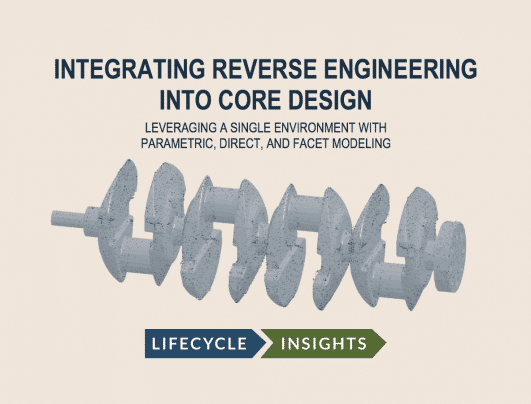 It examines the details of reverse engineering and discusses how the process fits into concept design, detailed design, prototyping, and testing. It also delves into the traditional and progressive digital solutions that support reverse engineering, highlighting their pros and cons. Reverse engineering is a critical part of design. It’s time the proper tools were available to support it.